Wow, a lot of really cool stuff has been posted the last few days. This Yakfinities has really gotten the creative juices flowing. He has to steal the energy from other power sources such as ships, power plants and other DROIDS to power his body or he'll fall apart. Yikes, that's one deadly droid! Very cool! I can't believe I forgot to post my droid! He's been sitting on my shelf for a while now.. Better late than never, I guess. He's not much, but he's quirky. At least in my opinion. 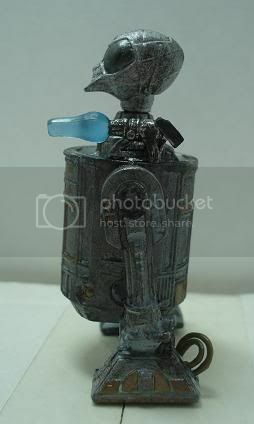 So its a protocol droid fused inside an astromech body. As you could probably guess the RA-7 found this extremely insulting. He took off and got a shoulder cannon mounted. Now now organic being is safe. A pirate raiding party discovered a decommissioned sentry droid in a warehouse and took it to use for their own purposes. After an attempt to reprogram the droid it was switched on only to find something had gone terribly wrong. The Droid went crazy and killed all the pirates. 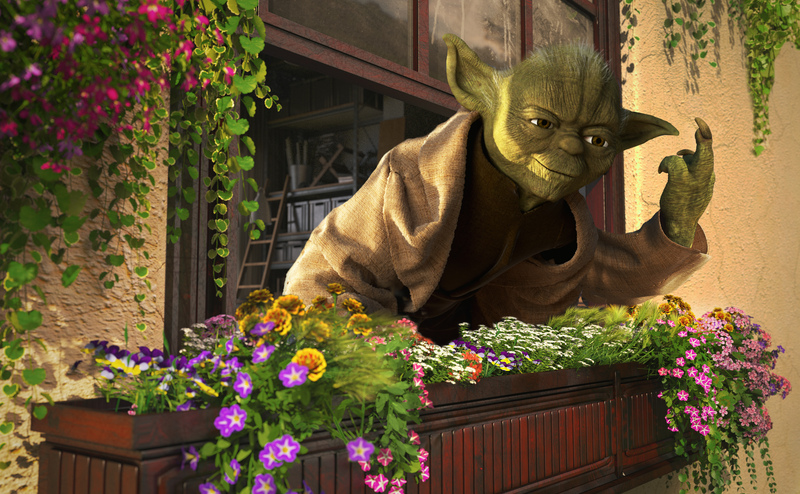 Its rumored the Droid is still there just waiting for someone or something to make the mistake of finding it. Last edited by Darth Bobo on Sun Feb 28, 2010 8:12 pm, edited 1 time in total. I like that.. looks like something from the old Mega Man games. We'll go ahead and accept entries until end of day Monday, March 1st this time. "As the Clone Wars raged on, General Anakin Skywalker was sent to destroy a droid factory controlled by the Separatists where he met and dueled this droid.."
This is the first YakFinites I've commented on, and there's been some awesome entries in this one! It's certainly got the creative juices flowing, and I think everyone who's entered a custom here deserves a big round of applause! 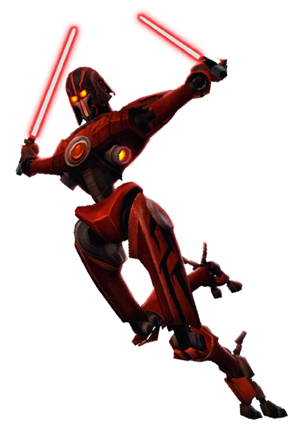 that Jedi Hunter droid is awesome. 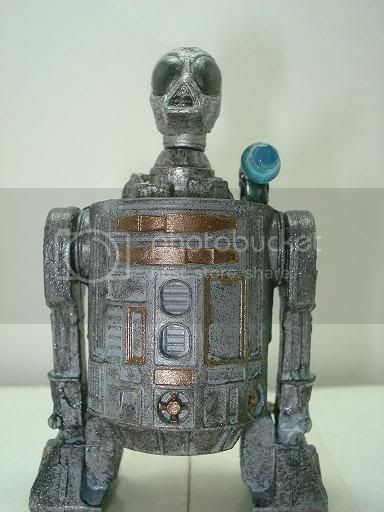 I want to make a fun droid based on something very similar so it give me ideas. But yours turned out great. Simply amazing work everyone... I was surprised with how many entries we had near the end. Loved each and every custom made for this, and we'll have a wrap probably tomorrow night. So, as the winner - darth naes, you get you pick three figures from the image below. These are loose/complete figures with the B.A.D. part included. However, the Snowtrooper is LEGENDS figures and will come with the weapons from the weapons locker. As the winner, you should declare which three figures you want in this thread, and then email me at rykrofenloe@yahoo.com with your shipping details. Then, DanOfTheDead, you should reply to this thread with your pick of two figures that are left. Straxus gets what is left - and both of you should also email me your shipping info. Here's the figures I still had in my "loot box" - will be looking to up the bounty for the next Yakfinities if possible. Thanks everyone for making all of these so much fun and bringing such a great atmosphere to the forums here - not just in the customizing areas, but all around the forums. We really appreciate your participation. WOW!!! I just wanted to say that there were a lot of top notch entries this time, just like every time. A lot of cool concepts. Much respect to DoTD and Straxus and congrats. I will pick Ki Adi Mundi, Leesub Sirln, and the Imperial Scanning Crew Member if that is cool. Just wanted to pass on that this a great place and there are a lot of hugely talented folks here.